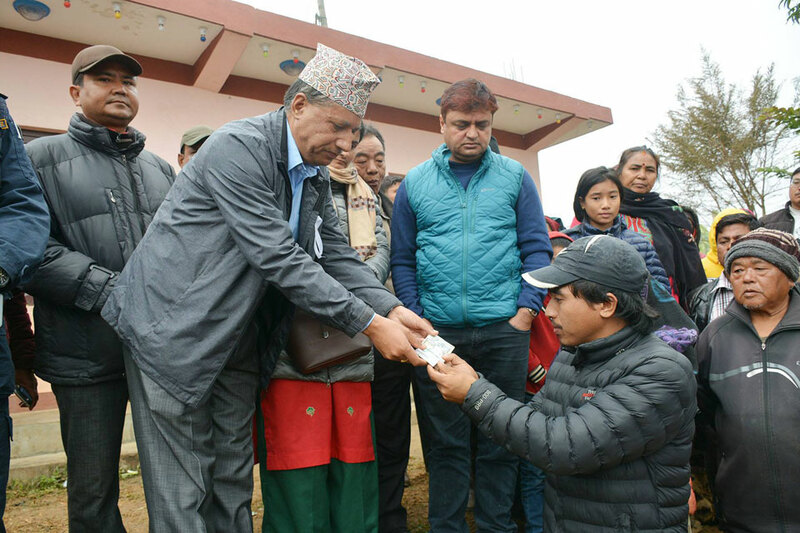 Chief District Officer Bharat Kumar Sharma handing over Rs 50,000 to Amrit Gurung's maternal uncle Hum Bahadur Gurung. TANAHUN, Dec 3: The locals of Bhanu Municipality in Tanahun have been terrorized by a man-eater leopard, which has mauled two minors in the last 17 days. Arjun Bahadur KC of Bhanu-2 stated that locals are worried about the safety of their children since the leopard is deliberately making young children its easy prey. Amrit Gurung, originally from Gorkha, was staying at his maternal home in Bhanu-2, Dhalkebar for his studies. On Saturday, the 10-year-old Gurung had come out of the house to wash hands to eat noodles. Sadly, he was attacked by a leopard, which ultimately killed him. As he did not return for a while, his maternal uncle Hum Bahadur Gurung went out to search for him. He called some of his neighbors for help after which Amrit's jacket was seen in a stream below the house. Later they found him in the same stream, seriously injured by the leopard. He was rushed to Dumre-based Laxmi Hospital for treatment where he died in course of treatment. Police reached the site as soon as they heard of the attack. Following the incident, Kedar Baral, chief of the Divisional Forest Office, Tanahun, informed that a 25-member team comprising of locals, police and forest officials has been trying to find the leopard. "We have already deployed a team to find the leopard, and have set traps in two places," said Baral. Chief District Officer (CDO) Bharat Kumar Sharma informed that the leopard has been attacking humans since a year. Seventeen days ago, another child was fatally attacked, probably by the same leopard. CDO Baral informed that the family members of those killed by leopard would be provided with Rs 1 million compensation, which has been assured by the government. "We will continue searching for the man-eater until it gets caught," said Baral. On November 15, four-year old Ranjita Lamsal of Bhanu-4 was mauled to death by the leopard. Seventeen days since the attack, another minor was killed on Saturday. CDO Bharat Kumar Sharma reached the maternal home of the deceased Amrit Gurung on Sunday and handed Rs 50,000 to his uncle Hum Bahadur. Amrit was a second grader at Manakamana Boarding School. CDO Sharma assured the family members that the leopard would be caught soon so that no such incidents will be repeated in the future.